Plants are native to dry and hot parts of South, Central and North America, and the Caribbean, and are currently one of the main gardening trends in the United Kingdom when it comes to landscaping and home garden plants. There are nine species and 24 subspecies of Yucca, and their distribution covers a vast area of Central and North America. Yuccas have adapted to a vast range of ecological and climatic conditions as is demonstrated by its distributional spread from the Gulf of Mexico to the drier central states such in Alberta in Canada, and through to the inland neighboring states and the Atlantic coastal. They are found in badlands and rocky deserts, in grassland and prairies, in light woodland, in mountainous regions, in semi-temperate and subtropical zones and even in coastal sands (Yucca filamentosa); though these areas are generally arid to semi-arid. Yuccas are generally known as ornamental plants in gardens and there are several yucca species that bear edible parts such as flowers, flowering stem, seeds, fruits and roots. The use of yucca roots as food often comes from the confusion with the same spelled yet unrelated to yucca botanically Manihot esculenta, commonly known as cassava. The roots of Yucca elata (soaptree yucca), are rich in saponins and are used in Native American rituals as a shampoo. Trunk fibers and dried yucca leaves makes the plant perfect for use in fires that are started through fiction as they have a low ignition temperature. Species such as Yucca filamentosa, in rural Appalachian areas, are coined as “meat hangers”, as its sharp spined tips and tough fibrous leaves are used in puncturing meat as well as knotted in order to form a loop wherein meat can be hung in smoking houses or for salt curing. Yucca plants (shrubs variety) can be grown both indoors and out. 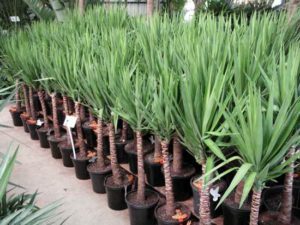 Bigger yucca plant varieties are planted outdoors whilst smaller ones can occupy spaces indoors. They can be planted in pots and containers as well as in garden beds, depending on what is available to the gardener. Many people enjoy growing yucca plants indoors because they are low maintenance and have the ability to clean the air. They are also used as decorations to enhance a home and perhaps give it a Southwestern USA theme.